I've never been tagged before-I feel so special. Thanks Carol! 1. Oh my, I was only 13....I went to school, lol. 2. My baby brother was born! 3. I was in a handbell club at school! 4. I had just moved in with my grandparents! 5. I helped start a group with friends that did things around our little community! 5. Play with my new printer some more!! 1. 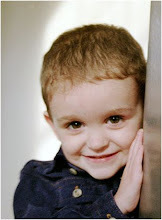 Put money away for college for my little ones so they aren't stuck with student loans like hubby and me! 3. Take my entire family (parents and in-laws and all!) on a vacation somewhere warm! 5. Open a scrapbook store or start a scrapbook company. 1. A bikini-kids give you stretch marks. 2. A perm-had these my whole life-NOT GOOD! 4. A shirt that shows even a smidget of my belly! 1. My Cricut Expression-I love it! 2. 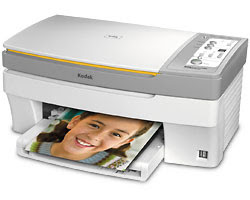 My new Kodak printer!!!! 3. My laptop-when its working again. 4. My digital camera-gotta have it with kids! 2. People who look at me and automatically think I'm 12 and pregnant or 12 with a toddler. Its not my fault I look so young! 4. Money, ok lack of money! I am only tagging 3 people because I don't really have a lot of people to tag! I'm still sort of new at this blog stuff! So I finally got my due date today! My (hopefully girl!) will be due on July 24th, which happens to be my birthday! I am so excited! Also, the wonderful UPS man should be bringing my printer tomorrow!!! YAY! I'm going to print so many pictures and get so many awesome pages done! Will be back soon to post some new projects! Thanks for stopping by! Well, I don't know what is up with my camera today, but I could not get a good picture of this. It is so pretty and I was so excited to show it off! Anyway, here is the front of the box. 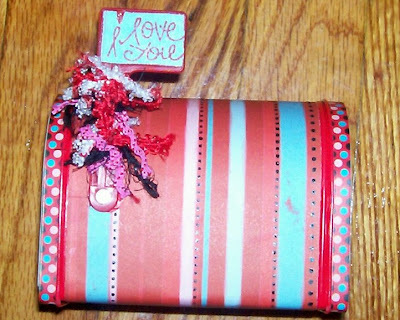 The chipboard is Heidi Swapp and the heart is from a pack of rub-ons I got for $1 at Michaels. And here's the side. All of the paper used was last year's Bo Bunny Valentine's line. I love it because it has blue in it! The polka dot strip is a border sticker cut in half from the Bo Bunny line also. On the flag is a Studio G stamp mounted on a sheet of paper. I Stickled the stamped area, and I also went over every single one of those little black dots with Black Diamond Stickles! The fibers were just random ones that I've been collecting! I really, really love this box! I plan to add some more embellishments to it, but I haven't figured out quite what yet. I hope you are all having a great day! I treated Aaron and I to breakfast this morning at Shoney's because he was up half the night and I was too tired to cook! Then we went and got groceries and have spent the rest of our day at home playing! I've been cleaning because for the first day in months I'm not feeling bad! Thank God for small miracles! Thanks for stopping by! Hey everyone, I was wondering what kind of printer you all have. I really need to get something new. Right now I have the Kodak Easyshare 4x6 dock that goes with my camera, and a regular HP printer. The HP ALWAYS runs out of ink. And it is about $60 to get the 2 ink cartridges for it. The Kodak is $20 for 40 pictures I think. So last night I was watching Celebrity Apprentice and they had a large Kodak printer on the show. So I went to the website and they have a special going for them. Do any of you have one of these or no anyone who does? The ink is crazy cheap! I really need something new-any suggestions?! Thanks! Well, we got our first big snow here yesterday, and we couldn't wait to take Aaron to play in it! This was his first time actually touching the snow. He was even sticking his tongue out as the snow was falling! His daddy pulled him around in his sled and he loved it! We only played for a few minutes because he refused to keep his gloves on, but I did get a few pics that I just had to scrap! So here is his snow page! I used a sheet of snowflake paper from the DCWV Christmas stack. I LOVE this paper, its so cute! 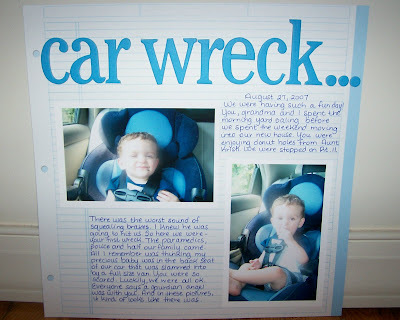 The letters were white Heidi Swapp chipboard that I covered with dark blue Stickles! Also, I put a dot of light blue stickles in the middle of every single snowflake on this page! 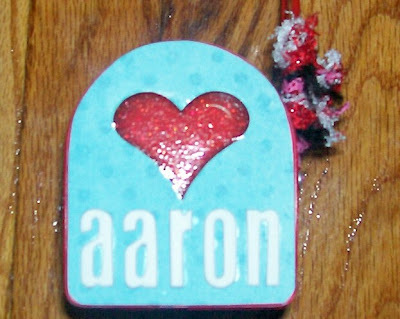 I don't get to use glitter much since Aaron is a "man", so when I can use it I go crazy! :) The "Falling Snow" is a Paper Bliss embellishment. It has little rhinestones on it that didn't show up in the pic too well. The top is a circle slide mount with white paper underneath. 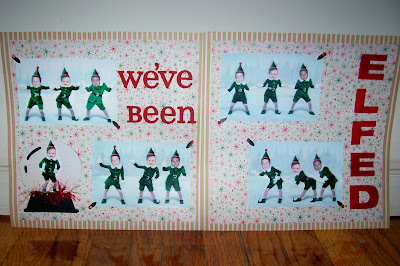 I covered the paper with-you got it-Stickles, and the letters are from TLC. I tied a glittery white fiber to the slide mount and secured it on the back of the paper, so the circle itself is loose and swings! I really love this page. Because I'm so behind on his album, I normally just try to get layouts done quickly, but I really took the time on this page, so I'm very happy with it! Thanks for stopping by! 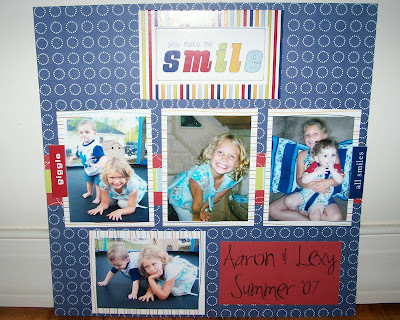 I'm still a few months behind, but these were pictures of Aaron and his cousin Lexy from the summer. Aren't they too cute? Fairly simple as always. I used Scenic Route paper and chipboard accents. Also the letters are Making Memories rub ons which I could use for everything! This one is REALLY simple. The paper is Creative Cafe. The chipboard letters are K&Co I believe. I NEVER use my own handwriting on my layouts, but this was different. A few months ago my mom, Aaron and I were in a car accident. I think we are all still traumatized by it. (Especially the car which was totaled!) We were rear ended by a huge van. I still look in my rear view mirror anytime we slow down to see if someone is going to hit us again! So I wanted to tell the story in my own writing. It turned out just the way I wanted. I didn't want anything extra taking away from the pictures and story! So thats about all the work I've gotten done lately. What a slacker I am. I've just been sick and exhausted because...BABY #2 IS ON THE WAY! Yep, I'm pregnant. Little unexpected, but wonderful just the same. Please everyone cross your fingers for a girl! I am really, really sick this time around. And I'm also feeling a little down in the dumps because I just lost my job this week. "Budget-shmudget".... So financially, I'm freaking out a little about this new baby, but hopefully everything will work out. So that is my news and update since I've been gone for a while. 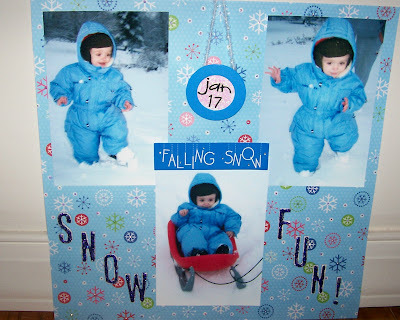 I'm hoping to do a blog hop later tonight, but right now, Jamie, Aaron and I are going to put on our snow clothes and go play outside for a little while! I hope you all have a wonderful day! Thanks for stopping by!